ST. GEORGE — Snow Canyon overcame three turnovers and defeated Shadow Ridge 43-16 and finally snapped its six game losing streak. 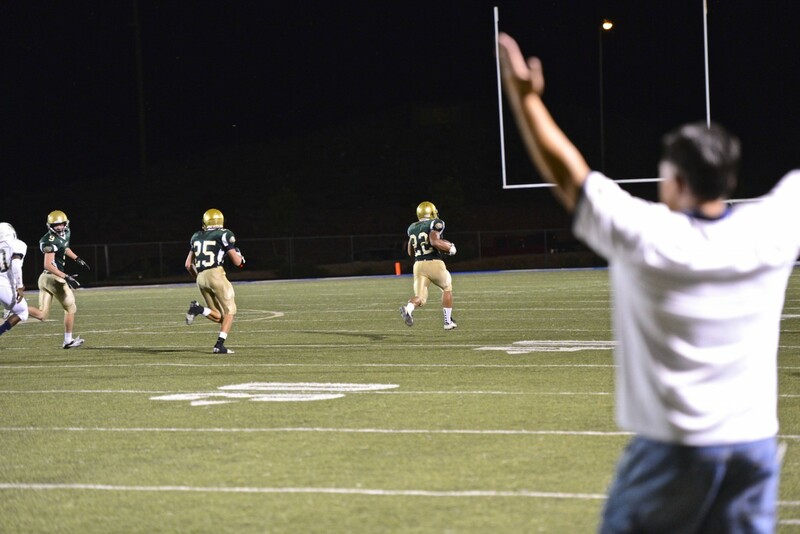 The Warriors hadn’t won a game since defeating Canyon View in September of last year, but such issues were put to rest after their dominating performance Friday night. The game, while a blowout, was not without its drama. Up 16-0, the Warriors lost track of Marquise Evans, who blew past the defense and ran for a 70-yard touchdown. Mitch Phillips scored next off a 3-yard run, but couldn’t convert the 2-point conversion. Still, Snow Canyon carried a 22-7 lead with the clock winding down in the first half. But the Mustangs weren’t ready to leave the field just yet. Quarterback Bakari Smith put together a collection of passes and plays to his key receiver, Evans, and then ran in an 8-yard touchdown with 1.5 seconds left on the clock. Snow Canyon stopped Smith from converting a 2-point conversion, but the Mustangs were still very much in the game heading into the locker room, down just 22-13. In the second half, on their first drive, the Warriors fumbled the ball on the 20-yard line. Their defense stood firm and held the Mustangs to a field goal, but the momentum had clearly shifted and the score was 22-16. 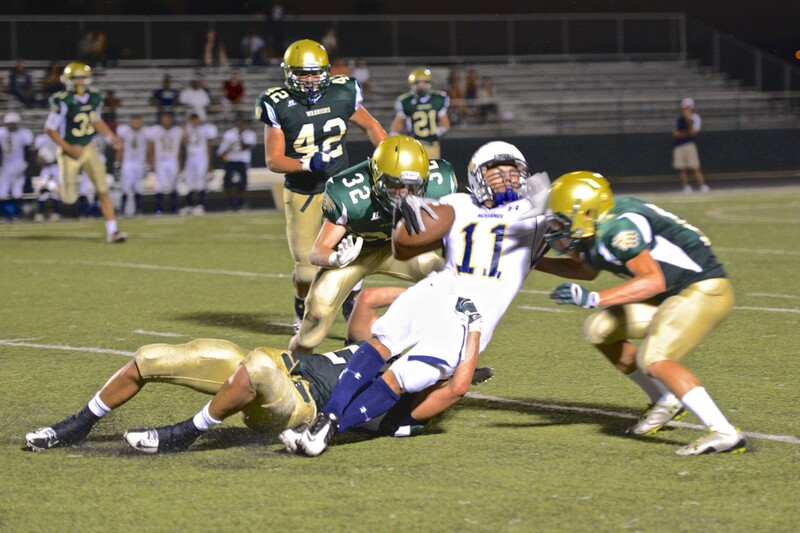 Snow Canyon fumbled the ball again after a big play by Phillips got them within 15 yards of the goal line. Luckily, Cade Bunting brought his A-game on defense and made it difficult for Smith to get a pass to his receivers. Facing third and 6, Smith ran straight into Bunting, who threw the quarterback on his back and forced the Mustangs to punt. Quarterback Mason Smith then took over the spotlight with a 68-yard touchdown run on the first play of the ensuing drive and pushed the lead to 29-16 entering the fourth quarter. Shadow Ridge kept coming though. After a successful drive, headed by quarterback J. Henderson, Cade Heward picked off a pass in the end zone resulting in a touchback that gave the Warriors the ball on the 20-yard line. Phillips cruised to another score and, just like that, the game was blown wide open. The night wasn’t over just yet for the Mustangs. Bunting nailed Smith again and forced yet another fumble. Taylor Johanson scooped up the loose ball and ran it back for an 80-yard touchdown. By that time the visiting fans were quickly filtering out of the stands. Mason Smith, who ran for 162 yards on the night, felt the win was a big confidence booster. Even Graft joined in the celebration, although he remained cautiously optimistic. Jeff Ames is a graduate of Dixie State College where he finished with a degree in English Literature. Since then He's been roaming southern Utah as a freelance writer, haunting web pages, newspapers and magazines with his crazy ramblings. he has a beautiful wife, a cute kid, and a deep admiration for the Utah Jazz.